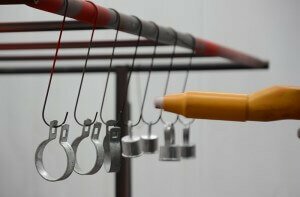 To get the best powder coating results, the surface you will be coating must be clean. Depending on the quality and type of metal, there are different levels of cleaning and pretreatment for powder coating to consider. You should also account for your customer’s requirements and how long the part should last in the field. What’s the best way to clean my metal? What kind of pretreatment should I use? What requirements does the finished product have? First, determine what you’ll be coating the most often. If you are coating sheet steel, for example, you will usually only need light oil cleaning. Angle iron or castings often need sand/shot blasting to remove scale and surface rust. Aluminum is prepared differently than galvanized or regular steel; the oxidation layer of aluminum must be removed, which requires certain chemicals that provide a good etched layer for paint adhesion. Identifying which type of cleaning is right for your process is the first step in long-lasting, quality results. Blasting. Blasting with sand or shot is a great way to clean up metal scale, laser scale, rough welds, or heavily rusted steel. Blasting is also used to strip off previously coated metal for refinishing. While blasting smooths out a lot of surface defects in raw metal, it does not fully clean the metal of oils or other contaminants. However, blasting does create a more adhesive surface for the powder coating after the part has been cleaned of residual soils. Washing. Pressure washing, dipping, or automatic washing (with a soap specifically formulated for the soils specific to your fabricating process) are the most effective ways of cleaning the metal prior to the next finishing stage. Steam cleaning or hot water helps break down the oils and can reach difficult spots or gaps in the surface. Detergent is the best way of cleaning metal of oils, waxes, polishing compounds, or other substances that will prevent the powder from sticking to the metal. Wiping. Solvent wiping is another way to clean up the metal of surface oils and contaminants, but it is an inaccurate way to clean. Since the part is manually wiped with rags, the rags can become saturated with the oil you are trying to remove. Clean metal by itself can be immediately powder coated but that will not give you superior performance and weathering characteristics. A good pretreatment allows the powder coating to better bond physically to the metal, withstand exterior weathering, and prevents flash rust prior to powder coating. Because of all the benefits associated with it, you should always consider adding metal pretreatment to your coating process. There are a few of methods of pretreatment. The first one is chemically etching the metal with an acid based product that promotes adhesion of the powder coating to slick or difficult to adhere to metals. Aluminum is typically a very slick substrate, so it needs some sort of surface treatment to remove oxidation and to etch the surface. Etching chemicals are usually more difficult to work with than the next method. The second method of pretreatment, phosphating, is used to improve the corrosion resistance of the product. Iron phosphate is the oldest method of pretreatment. It is a great way to improve the adhesion of the powder as well as doubling or tripling the corrosion resistance of powder by itself. In a pure steel fabrication process, it is the most common chemical pretreatment. Zinc Phosphate is a more robust process that results in the best corrosion resistance for steel products that are meant for ships or near coastal areas. Besides etching and phosphating, a third method of pretreatment is Zirconium Non-Phosphate pretreatment. In essence, it is a combination etching chemical such as zirconium fluoride in a low solids acrylic sealer that bonds to the metal. This newer process is used for multi-metal operations and also combines well with cleaners for a 1-3 step spray system, depending on the chemical manufacturer. Finally, your customer’s specifications will determine the cost and complexity of your pretreatment process. If a tractor-trailer wheel needs to last 5-10 years on the road under heavy use in ice and snow, then the powder coater needs a superior pretreatment process. A decorative base for an interior table would not need the corrosion resistance as the wheel, but might need a good etch or blast profile to prevent powder loss due to being bumped from time to time. An interior fluorescent light fixture would need neither improved adhesion or corrosion resistance, but would still need clean metal for the powder to be applied defect-free. With all these questions answered, you’ll be able to implement a pretreatment process that produces quality and consistent results for you and your customers. This entry was posted in News on August 11, 2015 by Bruce Chirrey.